It was such a great Summer, full of beautiful and relaxing moments. that was a really lovely experience. this country and saw it from North to South, West to East. new working week with charged batteries! Drago mi je čuti da ti je bilo sjajno ljeto, baš si se fino naputovala i nauživala i sad mirno možeš u nove radne pobjede :)) I hvala ti na brizi, ja sam konačno ponovno u punoj snazi i nadam se da se nešto onakvo više neće ponoviti. I love this the top is gorgeous! 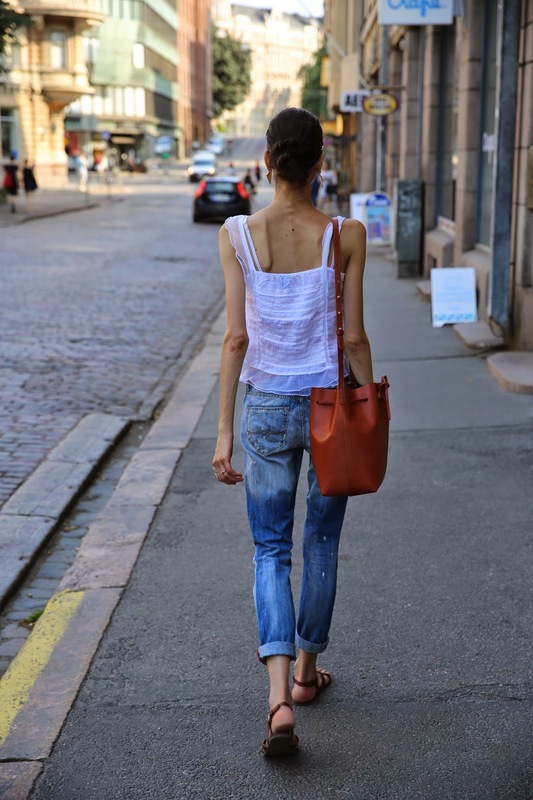 Love your white and jean look! Great transformation into fall outfit! Nice outfit!! Love the top!! the bag is gorgeous ! Great outfit & love your jeans! Love this simple summer look! That top is so cute, and I'm loving the distressed denim. Lovely look! Love your fluttery top -- it's so cute! The top is absolutely stunning! You look great dear! The top is lovely! super cute look! I really love your darling blouse! so cute! this is a very cool and chic look! Very pretty and cool outfit. And I would like to visit Finland too, such an intriguing country.